A reader uses a macOS Photos library stored on an external drive, but his startup disk has a bloated cache. I have a massive Photos library and use iCloud Photo Library stored on an external HD to maintain a local backup of all pictures. However, my wife and I use a large number of shared albums to share our pictures with each other, and these keep eating up space on my MacBook Pro in com.apple.cloudphotosd. My MacBook Pro keeps filling up, rendering Photos completely unusable. You’re not alone in experiencing this! And it’s definitely a loose thread in how Apple manages photo storage. The ~/Library/Containers/com.apple.cloudphotosd folder is a cache, not part of your Photos library. It’s used both for temporary storage, as images are synced and transferred to your library, and as local storage for shared iCloud images. For most people, shared iCloud albums don’t add up to much. But because you and your wife are sharing a lot of images—and I’d guess you might even be shooting and syncing in a raw photo format, which makes files even bigger—your cache is enormous. Even if you have Photos set to optimize images and videos (in Photos > Preferences > iCloud) instead of storing full-resolution media, shared iCloud album remain cached at full resolution. For a less-frequent iCloud Photo Sharing user, this folder only consumes about 1.5GB of my startup volume. The bad news is that this is a design flaw, rather than a bug. Apple intentionally stores data there. As long as you’re sharing lots of images, this will remain a problem. You can reduce the number of shared albums to reduce the storage consumed. Select any shared album and click the strangely named People button at upper right (it’s a silhouette of a person with a circle around it). You can then click Delete Shared Album, which empties the local cache without deleting the photos you shared, and disables sharing to other people. 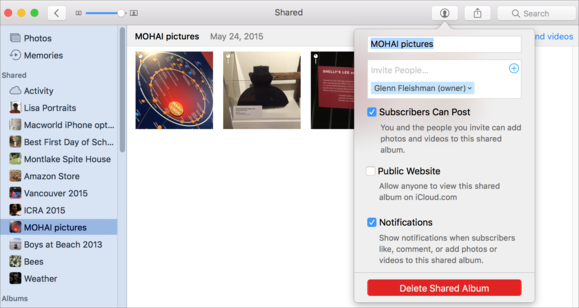 Removing iCloud-shared libraries reduces cached data on your startup disk. Some users have reported on forums a related problem: that files already synced to their Photos library or which no longer shared are still lodged in the com.apple.cloudphotosd folder. You need to delete that folder to refresh the cache, apparently; that worked for many of those who tried it. Warning! This requires temporarily disabling iCloud Photo Library. If you have a large library synced with iCloud, disabling and later re-enabling it will cause a complete re-sync, even if no new images need to be uploaded. Consider your bandwidth use and the amount of time it will take. In Photos > Preferences > iCloud, disable all options. Select Go > Go To Folder in the Finder and paste in ~/Library/Containers and click Go. Launch Photos and re-enable your options. Any shared albums will be re-downloaded and cached as before.